by Hannibal Travis, Florida International University College of Law. 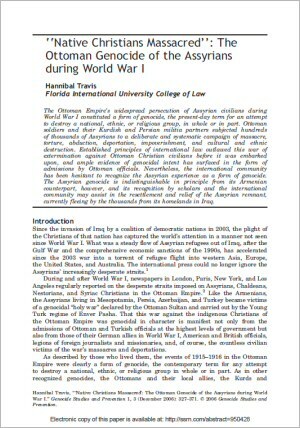 The Ottoman Empire's widespread persecution of Assyrian civilians during World War I constituted a form of genocide, the present-day term for an attempt to destroy a national, ethnic, or religious group, in whole or in part. Although there were no extermination camps on the scale of Auschwitz, the genocide of the Assyrians resembled the Holocaust of Jews, Slavs, Roma people, leftists, homosexuals, and other minorities under Nazi occupation during World War II because Ottoman soldiers and their Kurdish and Persian militia allies subjected hundreds of thousands of Assyrians to a deliberate and systematic campaign of massacre, torture, abduction, deportation, impoverishment, and cultural and ethnic destruction. 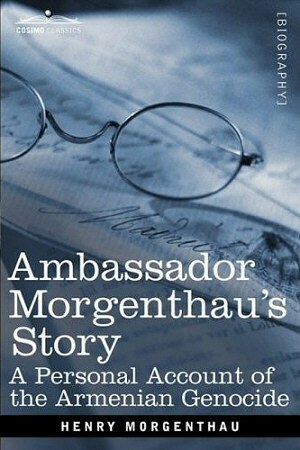 According to the American ambassador to Constantinople from 1913 to 1916, Henry I. Morgenthau, widely regarded as a principal source of information on the Armenian genocide: "The story which I have told about the Armenians I could also tell with certain modifications about the Greeks and the Syrians," as Assyrians were often known to the West. He added that the Ottoman Empire "decided to apply the same methods [of "wholesale massacre"] on a larger scale not only to the Greeks but to the Armenians, Syrians, Nestorians [i.e., Assyrians], and others of its subject peoples." In 1918, according to the Los Angeles Times, Ambassador Morgenthau confirmed that the Ottoman Empire had "massacred fully 2,000,000 men, women, and children¿Greeks, Assyrians, Armenians; fully 1,500,000 Armenians." In conclusion, I will contend that the legal and historical recognition of the Assyrian genocide at the hands of the Ottomans is vital to focus the world's attention on the Assyrian remnant in Iraq. That remnant has been scattered by more than a century of massacre, discrimination, and religious persecution into non-viable communities that are still waiting for their homelands and human rights to be restored. U.S. officials have documented an "ethnic-cleansing campaign" against Assyrians in present-day Iraq, with "systematic attacks" against Assyrian civilians, bombings of Assyrian churches, and the driving of most Assyrians out of Iraq. Genocide and ethnic cleansing give rise to legally enforceable claims for reparation and restoration of property and the value of lives lost. But because their genocide has rarely been recognized, the Assyrians driven from their homes over the past century have received relatively little by way of compensation or assistance with rebuilding. This article calls upon the international community to focus its efforts on the security and resettlement of the Assyrian people.